Multi-Function DAQ, ATEasy Training USB Board | Marvin Test Solutions, Inc. The GT98901 Demo board is a USB controlled, cost-effective, multi-function PCB assembly. The module is completely self-contained and includes an LCD display, measurement and stimulus resources, digital I/O, relays, and switches – all of which can be accessed and monitored via the USB port using a SCPI command set via a USBTMC interface which supports the USB488 protocol. Power for the board is provided via the USB interface, providing a totally self-contained assembly which can provide users with a simple yet complete vehicle that replicates many of the stimulus and measurement functions associated with ATE systems. 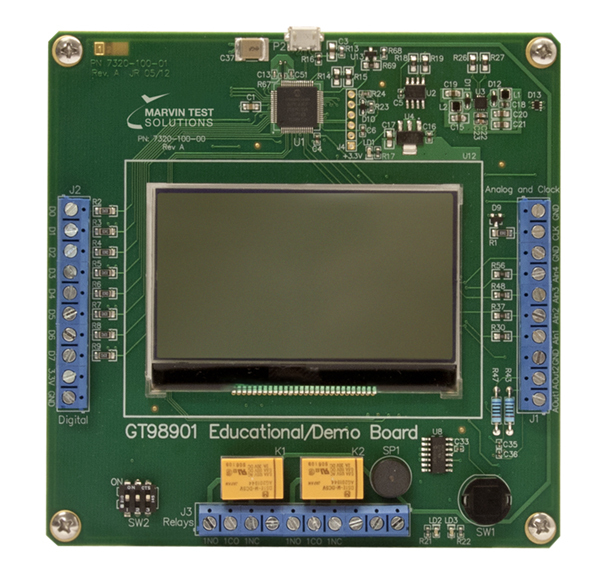 When combined with Marvin Test Solutions' ATEasy® Test Executive and Test Development environment, the GT98901 is the ideal product for creating and supporting ATE training and education applications. Control of all functions is provided by an on-board, PIC micro controller. There are (4), 12-bit, A/D channels and (2) D to A, 8-bit channels. Additionally, there are (8) digital I/O channels, (2) form C relays, (2) LEDs, buzzer, (3) DIP switches and a push-button. All features are accessible via the SCPI function library which is provided with the board. Additionally, an LCD display is mounted on the board which provides board status. Control and powering of the board is provided via the USB port. The board is supplied with the GtDemo software package which includes a virtual instrument panel, a Windows 32-bit DLL driver library and documentation. The virtual panel can be used to interactively program and control the board from a window that displays the instrument’s settings and status. A PDF User's Guide provides documentation that includes instructions for installing, using and programming the board. A tutorial is included which contains many exercises for learning about ATE, DAQ, SCPI and DLL based programming, using ATEasy as the test development software environment. A limited edition of ATEasy is included when ordering GT98901-EDU or GT98901-INT. The limited ATEasy edition uses the GT98901 as a license (must be connected to the computer at all times using the provided USB cable). The limitations of the special ATEasy editions are: 1) Project can have up to two drivers in addition to the Test Executive and GtDemo drivers, 2) No EXE build capability, 3) GT98901-EDU can be only used by teachers and students of Academic Institutions (not for use by commercial organizations).